Tonight's red post collection includes Meddler's quick gameplay thoughts for July 11th, a new Runes Corner, showing off another new rune, a Nexus article on how Nightbringer Yasuo and Dawnbringer Riven came to life for the Vs. Event, and more! MF - Potential buffs to her attack speed, supporting more auto attack heavy playstyles. More experimental, so moderate likelihood some or all of the changes don't make the cut. Currently testing a version where CDR does stack with the ult Q CD reduction, given CDR's a pretty core part of many (most?) Nasus builds. Numbers in right now for the E are 15%-35%. That's also non final though." That armor pen is regular % armor pen, and not % bonus armor pen, right? Changing it to % bonus pen would kill his ability to actually kill squishies. Correct, total % is what we're testing." Just out of curiosity, will Kayn and Urgot be available for worlds? Or, is that something your not familiar with? EDIT: I mean, will they be available for pros to play on the worlds stage? Yes, plan is they'll be available." This is a fairly lackluster set of changes. Nothing about zac at all, who has 3 different forms of CC unaffected by merc treads or tenacity, and deals a disproportionate amount of damage for how tanky he is and how much CC he has? Personally if he gets nerfs I would like to see nerfs to his usability, because his engage skill (E) is far too simple to use for how powerful it is, especially as a non-ultimate ability with a low cooldown. The range on the cone is very wide and forgiving, and he can hold the charge for a long time, or even cancel it completely. How about more punishment for Zac players who dont play carefully? I propose the cone width get severely nerfed, if you want to allow its ridiculous range, and work like a "slingshot" kinda like Rumbles ult? so he has to make a quick decision. You can even increase the travel speed if you do this. Another idea could be to make him have a self-stun upon impact if he fails to hit an enemy, so Zac players are punished for bad plays. After all, this is a champion that has literally over 100% banrate. Zac's one of the champs, like GP and Thresh, that'll likely be changed as part of the large number of simpler changes pass in 7.15. As per usual these posts aren't a full set of everything in a patch, but context on a number of things as to what we're thinking." So does this mean Lee sin and Caitlyn nerfs? They are too dominant now. Lee and Caitlyn are being looked at at least for possible nerfs. In Lee's case we also need to do a sweep of some other champs who jungle in general (otherwise we're just pushing play from Lee onto Elise/Gragas/Rek'Sai/Zac potentially). In Caitlyn's case we need to see what impact the 7.14 nerfs do/don't have." Hey Meddler, any comment on Karma? She's currently sitting on a 45% win rate in both Mid and Support, and you've recently spoken about the possibility of her receiving small work at some point. Update: No, no plans for Karma changes in 7.15. She'll need work at some point, won't be buffing her next patch though given we're still seeing her as a pretty dominant mid pick in pro play." Hey Meddler, any thoughts on Kindred? How are they doing after all the buffs? Are you planning to give them a little bit more power? Yeah, that looks like it got bogged down somewhere. I'll check in on what's happening there. " Hello! And welcome to another Runes Corner. I’m Riot Gregab from the team working on Runes Reforged and this week we’ve got a sneak peek of a new keystone we’re working on tentatively called Meteor. Check it out and let us know what you think down below! When Syndra’s Dark Sphere hits Cassiopeia, the meteor fires off from Syndra’s position aimed at the spot where the sphere hit Cassio. Note the red circle that shows up on the ground after Dark Sphere hits.That’s an indicator showing where the meteor’s going to land, giving opponents an opportunity to dodge it. Plus, note the small orange sphere orbiting Syndra before she casts Dark Sphere. It indicates that Meteor is off cooldown and will fire with her next ability. Despite these warnings, Cassio stands still, allowing the meteor to hit her. If she’d walked away before it arrived she could have avoided its damage. One excellent way to prevent your targets from walking out of the meteor’s path is to stop them from being able to move at all. This gives Meteor excellent synergy with CC abilities like Lux’s Light Binding. Like Perxie, which we showed off before, Meteor is a Sorcery keystone. We’ll have more to say about the identities of the individual styles soon, but here’s the short version: Sorcery serves champions who want to enhance ability-based damage, especially AoE spells. Our motto for it is “unleash destruction”. 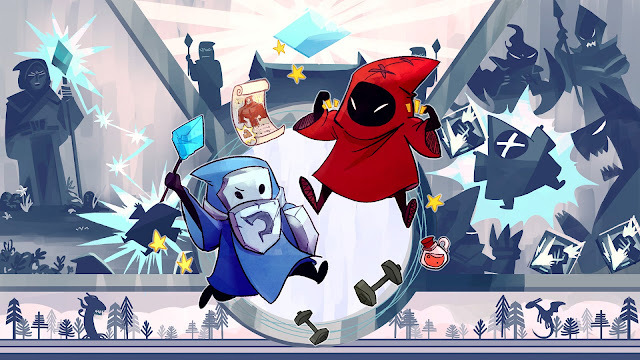 Let’s take a look at some similarities and differences between these two keystones to get a better idea how you might decide when to take one over the other. The first obvious difference is that Meteor does significantly more damage when it hits (40-100 based on level vs Perxie’s 10-40, plus lower AP and AD scaling ratios). That’s because Perxie is more consistent. It always hits its target while Meteor can be dodged. Also, Perxie sacrifices some raw damage for versatility. When you shield an ally with it, you give up its bonus damage until the pet returns. Whereas Meteor, on the other hand, is all damage. One similarity between the two keystones it that they both play off of your positioning relative to enemies. However, each rune requires very different positioning to get the most out of them. Perxie asks you to move towards your target to get the pet back sooner and shorten the cooldown. When Perxie’s available it automatically hits enemies you damage, but to land Meteor, you have to position your spells with it in mind, placing them so it’s hard to dodge the flaming rock from the sky that follows. I hope this quick post gave you a clearer idea of what a keystone can be and got you excited to try out Meteor. We’re looking forward to hearing your reactions. Who would you take this on? What cool synergies can you think of with it? We’ll stick around in the comments to nerd out with you and answer any questions you might have. Thanks for reading! Rune’s Corner: Content Development Peek." "Totally with you. As mentioned in the post the current fireball effect is very much temporary. It's just a placeholder put in by a designer to make it so we could playtest the rune internally (we've jokingly been referring to it as the "meatball" around the team). If and when Meteor's released it would have much more appropriate effects made by a real vfx artist." Are you afraid that with Sorcery runes, you may end up cluttering the visuals of the game even more? In this type of game, a lot can happen in a span of half a second, and all the abilities flying around combined with the new special effect runes, especially ones with big visual effects like these, might really hinder the ability to read a teamfight or the like? Any concerns on clarity with these, or other runes? Hi, it's me your person who is very, very concerned with clarity. I totally agree that it's really important that we don't add a ton of additional visual noise to the game with a buncha giant meatballs flyin' everywhere. This particular temporary particle is WAY too loud, we all agree. Something like the Sorcery keystone Perxie we showed (which also has temporary particles rn) is also above the noise level we want to hit on for when the rune actually comes out in the game. TL;DR We wanted to share with you guys some of our cool stuff that's not completely done right now, and Meteor is an example of a Keystone that is not at the quality & clarity bar VFX-wise for release yet." Seems to me like a very specific keystone aimed at control burst mages and very specific ones at that, some of my worries is that it seems to be hard to proc and use your other poke spells. For example it seems great with lux q however i use lux e to poke enemy and it will proc my metor which seems to make it easy to dodge. This leaves me with very little window of actually begin able to use it. I would suggest to make it work only when i land cc on enemy champion. (similar to Courage of the Colossus ). I can see how you'd have that concern, but it actually works with more spells than you might think. For example, we've found that with decent positioning you can land Meteor off of Lux's E a lot of the time, even after they have tier 1 boots." Wonder what you happen if hit with a long range ability like ashe or jinx ult, or maybe how it would interact with heimer turrets. 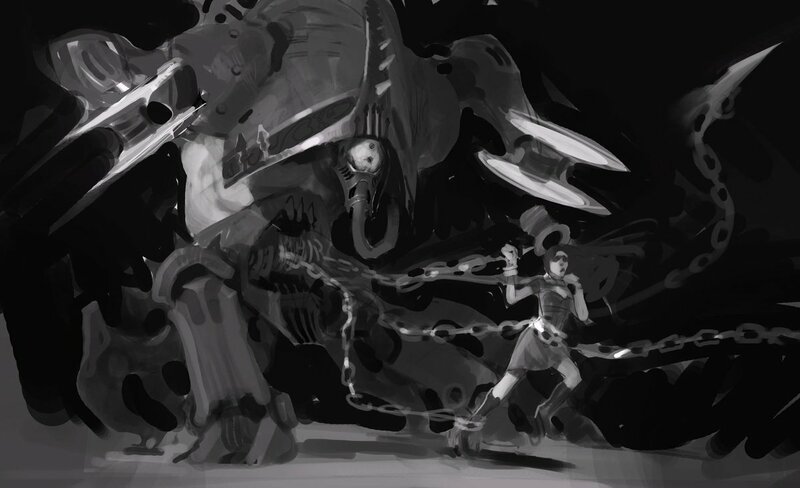 We've seen this one proc'd with all kinds of creative abilities - for Jinx & Ashe ult it works like you think it would. There are a lot of cool ways we've seen it used by someone going "Do you think....?" EDIT: Pretty sure Heimer turrets don't work but there's another Yordle I've seen that makes good use of it. :) "
Is this the Thunderlord's replacement? If so, what led you to favour this design over that of TLD? No, this is not related to TLD." ... Are you telling me my Cannon Barrage can send a little meteor to Botlane? Is it a set Travel Time or does the Travel time increase with distance? It's a fixed travel time - it gets speedier if you're super far away." Can anyone give more details about how often perxie can be proc'd. Does it proc on every auto attack or every spell? But which enemy hit by the aoe spell gets prioritized by meteor? Let's say Lux hits 3 people with ult which are in a line and each hit champion is 1000 unit away from the other. On which one's position would the meteor home in? Does it work like Ludens proc in that regard? Yes, it works like Ludens in that regard." Animators who work on Legendary skins are tasked with the sometimes tricky job of creating new animations for existing champions. The degree of this trickiness is often determined by how old the champion is: Older champions tend to be easier to make prettier but often have dated design setups, while newer champions have higher-quality animations but can be complicated and difficult to improve upon. Bringing Dawnbringer Riven and Nightbringer Yasuo to life created two sets of differing challenges; though development happened simultaneously, the age of each champion meant each required its own unique approach. Animating Riven was about making her feel more modern and like a higher being, while working within the constraints of an old system. Yasuo’s new moves were focused on making his already complex animations look and feel even better…and more chaotic. And in both cases, Riven and Yasuo still needed to feel like Riven and Yasuo. Riven and Yasuo both fall into the “difficult-to-play-even-though-not-everyone-thinks-so” category. Playing each sword-wielder to their maximum potential relies on having impeccable timing, weaving autos between spell casts, and cancelling animations (more so Riven for that last one). To weave in those extra autos, it needed to be really clear where exactly Dawnbringer Riven and Nightbringer Yasuo were in their auto attack animations. Both Legendaries have dramatic, distinct frames during their auto attacks: there’s an obvious windup, a quick swipe, then a finishing stance. These three poses make it clear when exactly they begin an auto attack, when it connects, and when it’s over—making squeezing in that last auto a little bit easier. Yasuo’s auto attack animations were also specifically designed to feel even snappier than in his base skin. Each pose of his auto animation is pushed even further than usual, so he’s really reaching and arching his body with each swipe. Plus, he’s double-handing the sword for maximum power. Riven was created back when new champions were launched every two weeks. This quick cadence meant there was a limited amount of time to devote to each area of development, which is why her animations are so simple. The upside to her simplicity? Devs had a bunch of ways to make her existing animations look even better for her Dawnbringer skin. Riven’s backend design setup was a hurdle while animating, even with starting from scratch. Riven is the only champion in the game who can cancel so many animations, and the tech used is pretty dated. 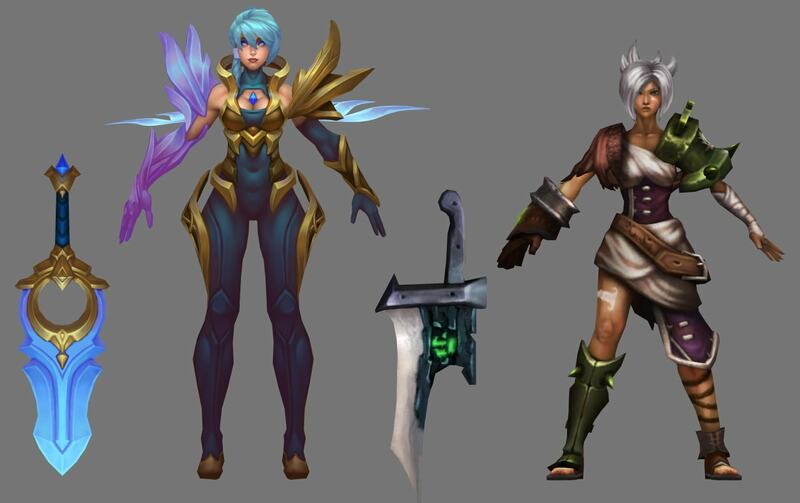 “I originally wanted to give Riven transitions when she cancelled some of her animations,” says Riot Whist, “But we were limited by the older tech.” One possible way to add animation transitions between cancelled abilities would have been to make changes in the backend design, but that can get risky. There are a lot of delicate systems that allow for Riven to play the way she does, and making changes could cause some of her cancel moves to stop working…or cause new ones to appear. Because we didn’t want to risk breaking Riven, Riot Whist focused on making her core gameplay feel the best it could be. “Everything she does should just feel extra good,” Riot Whist says. Riven’s ultimate form was one of the areas with lots of room for improvement. When Riven ults, it’s supposed to represent a return to her former glory, but her base doesn’t really show this well. Pressing R on base Riven causes her to raise her sword, which then reforges and gets giant and glowy. But when she starts flipping around and wrecking you in-game, this change isn’t always super noticable. Dawnbringer Riven gave devs a chance to really push the fantasy while also visually clarifying her gameplay mechanics. Dawnbringer Riven’s entire body becomes ascended-looking during her ultimate, which is mostly communicated through her golden character model and shiny VFX. Riot Whist considered creating unique auto attack animations for her ultimate form, but this wasn’t great for gameplay—learning three more auto animations seemed like a bit much, for both Riven and her victims. Instead, Riot Whist created a more aggressive run for while Blade of the Exile is active. “Now, if she ults in a bush and runs at you, it’s more clear she’s in her ‘probably hurts more’ form,” Riot Whist says. Unlike Riven, only about half of Nightbringer Yasuo’s animations are brand new, which is mostly because he’s a new(er) champion. His animations are still considered pretty high-quality, and some of them are really complicated. In fact, Yasuo has one of the most complex animation cycles in the game. It might not seem obvious at first glance, but Yasuo’s sheathing and unsheathing of his blade is pretty complicated under the hood. Whenever Yasuo enters combat, he draws his sword, and shortly after leaving combat, he returns it to his sheath. The reason this gets so complicated is because Yasuo can sheathe his blade while running, standing still, or transitioning between the two. There are a bunch of sequences that have to line up perfectly during this animation because otherwise, his torso, arms, and legs won’t line up properly. Because Nightbringer Yasuo wields his sword with two hands, this entire animation sequence had to be reworked, which required a lot of animator time. Rather than rebuilding all of Yasuo’s animations from the ground up, senior animators Drew “sandwichtown” Morgan and Matthew “MIXX3R” Johnson focused on areas where the chaotic, powerful nature of Nightbringer Yasuo could shine through—such as two-handing his blade. But because Yasuo’s gameplay revolves around precision, they had to get a little creative to capture the chaos. One of the ways they did this was by adding six “spikes” to Yasuo’s body that could be freely animated. “The spikes are really dark in color, so it’s a subtle change to his shape language,” sandwichtown says, “but we thought it’d be a cool way to layer in the demonic theme.” The spikes were animated in a variety of ways, flaring up during his emotes, idle, and attacks. MIXX3R and sandwichtown experimented with a few different multi-slashes, but nothing felt as satisfying and formidable as one massive strike. Although we haven’t hit that point quite yet—Yasuo is an example of an in-between champion who is just starting to get complicated from an animation standpoint—it is coming. One possible approach would be to look for ways to subtly elevate the skin’s thematic via new animations, as opposed to big, flashy add-ons, like with Dawnbringer Riven’s floating run or Nightbringer Yasuo’s dual handed weapon-wielding. Either way, animators will still be working to create fresh new moves for the champions everyone knows and loves…like Riven and Yasuo." Hey, everyone! I'm Riot King Cobra and it's time for another round of Patch Chat! These threads serve as opportunity for us to talk about the patches that come out every two weeks. You can find the most recent patch by following this link: Patch 7.14 Notes. Kayn, the Shadow Reaper arrives to the Rift in Patch 7.14 along with a number of other changes. 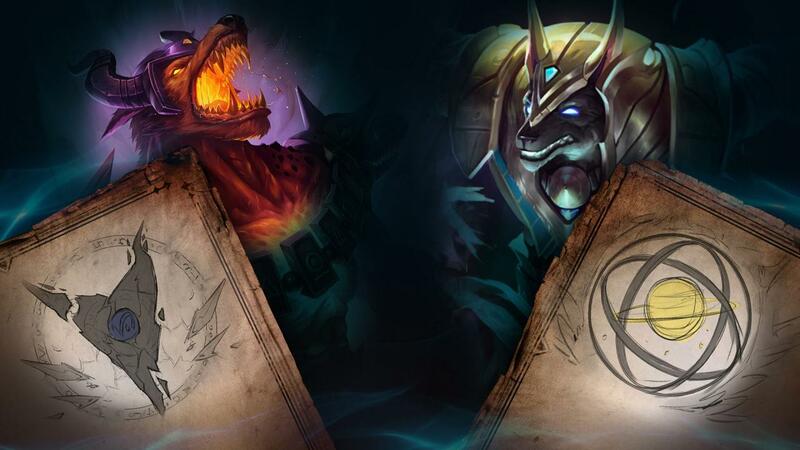 Alistar's ultimate has received a buff to the damage reduction he gets from it, Caitlyn's attack speed growth has been lowered more, Cho'Gath, Diana, and Singed have all received a small amount of gameplay changes, and a number of other champions in need of attention have as well. 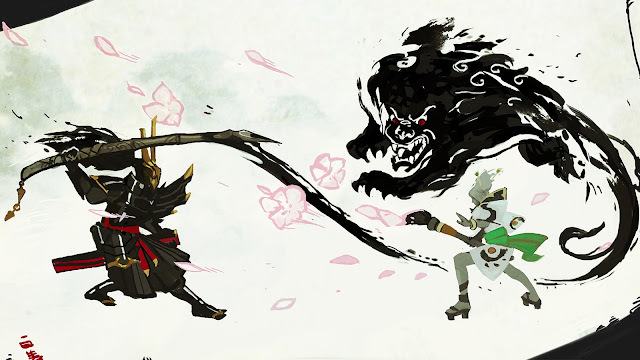 In addition to champion changes, a number of items have changed as well - we made modifications to Thornmail, Randuin's, and some of the Lethality items. 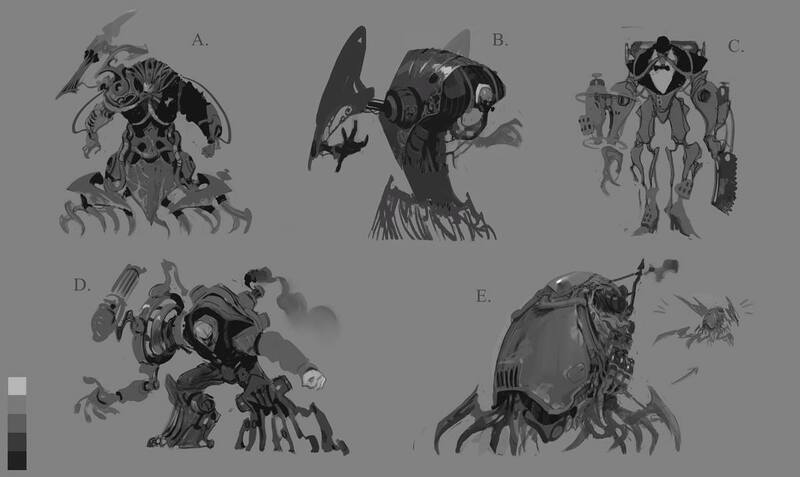 "Early Urgot Concepts by the glorious @VictorMaury_ , we pushed it super far, before reeling back into the what you have now." 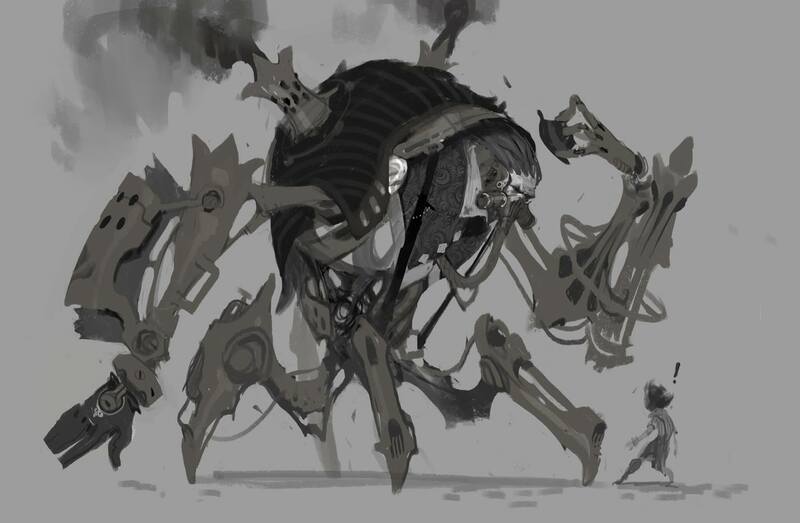 This was my favorite early Urgot Concept, I think I bugged @VictorMaury_ about this one for a week or two. "The ulti cancelling abilities weren't intentional from beginning, just a bunch of arcane side-effects from how the ability is implemented. The vision changes were a part of a more comprehensive look at how abilities and vision function in the game. We aren't done with the vision changes yet, but this was a good first step. We feel like champions with incidental vision granting abilities do not have to take sufficient risks and makes for a worse game holistically (champions being forced to facecheck or pay a set cost [eg. use a ward]) is something that we feel all champions should be held to, unless their abilities explicitly allow them to bypass this (eg. hawkshot). For reference, I didn't make this change, but OK'd it."